As speculation continues over the jewel possibilities for the Duchess of Cambridge at next week's state banquet, let's have a look at the tiara she's worn most recently: the Lotus Flower (or Papyrus) Tiara. The first royal wearer of this tiara, which takes its name from the lotus flower (or papyrus leaf) elements that dominate the piece, was the Queen Mum. She took a page out of her mother-in-law’s book when creating the sparkler: it was made from a necklace that she received as a wedding gift in 1923. The necklace, which was made of diamonds and pearls and featured meander and festoon designs, was given to her by her husband, the future George VI, who had purchased it from Garrard. Even so, Elizabeth decided she’d rather dismantle it and reuse the gems elsewhere. Only six months after she received it, Garrard broke up the necklace and used the diamonds and pearls to create this tiara. Perhaps Bertie had learned from his mother not to have sore feelings over diamonds given, dismantled, and repurposed? Regardless, Elizabeth wore the tiara in a series of portraits that were later used heavily in the publicity materials for the 1937 coronation, although some illustrators took a bit of artistic license in their depiction of the piece. To me, this is one of the few 1920s-era tiaras that works when worn either low across the forehead or atop the head, the way we generally see tiaras worn today. That’s the way the second wearer of the tiara, Princess Margaret, used the sparkler. Margaret received the tiara from her mother in 1959, just before she married Antony Armstrong-Jones. Along with the Poltimore, it became one of her most frequently worn tiaras. In 1993, Margaret loaned the tiara to a third generation. Her new daughter-in-law, Serena Stanhope, wore the tiara at her wedding to Viscount Linley, Margaret’s only son. (Serena also wore a wedding dress that echoed her mother-in-law’s famous 1960 wedding gown — not a bad way to ingratiate yourself with your royal MIL, if you ask me). When Margaret died in 2002, this tiara was not among the pieces that were auctioned by her children — in fact, the Poltimore was the only one of Margaret’s tiaras that was sold. 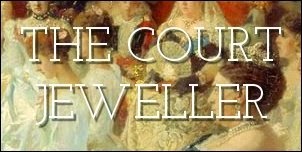 For years, jewel lovers speculated about the ownership of the tiara after Margaret's death. Because Serena Linley wore it at her wedding, many assumed that the Linleys perhaps inherited the tiara from Margaret. But in December 2013, the Duchess of Cambridge surprised everyone by wearing the tiara at the annual diplomatic reception. It turns out, apparently, that Margaret returned the tiara to the royal vaults, either before her death or in her will. And so the Lotus Flower lives on, being enjoyed by an entirely new generation of Windsor women. Update: Kate donned the Lotus Flower for a second time in October 2015, when she attended her first state banquet.